One of the things that annoys me most in period films is the fact that although the filmmakers often take great care that the physical environments and wardrobes are true to life, when it comes to values (aesthetic values and moral-philosophical values) the creators absolutely reject any attempt at historical accuracy, and anachronistically import present-day degenerate values into the works of nobler bygone eras. Thus, when it comes to moral-philosophical values, heroes and heroines in historical films often espouse modern notions of "social justice" and feminism and hyper-democratic levelling principles in eras where such thinking simply didn't exist. Just as offensively, when it comes to aesthetic values, ingénues are universally reconfigured to resemble the modern, androgynous, emaciated standard rather than the ideal of full-figured femininity which would actually have been preferred in every century prior to the 20th. With that in mind, I was intrigued when I came across a very interesting post at a web log which is maintained by a group of female writers of historical fiction. The upshot of the piece is that one of the female writers, in a rare moment of soul searching, acknowledges that the historical novels that she and her peers write are grossly inaccurate and deliberately anachronistic in the depictions of their heroines. For most of the historical past that our characters call home (England from the Middle Ages until the 19th century), the fashionable ideal was considerably more upholstered than in our own time. A voluptuous figure was a sign of health and prosperity, desirability and fertile youth...The famous/infamous courtesan Lola Montez (1821-1861) wrote a bestselling advice book that included the perfect proportions for a Victorian beauty: hips that must be wider than shoulders. How encouraging that she at least acknowledges the glaring discrepancy between what modern artists create and historical truth. The ample young woman drawn by Thomas Rowlandson (1756-1827) in the Regency period would have represented the heights both of beauty (she is based on Emma, Lady Hamilton) and longing. Most young Englishmen were engaged in fighting at some point in the interminable wars with France, and Rowlandson’s women represented all that was most alluring about the English girls at home, with their wholesomely ample figures and rosy cheeks the products of good English beef and country air. In my last blog, I mentioned the real-life heroine of my July book, Louise de Keroualle, Duchess of Portsmouth (1649-1734)...growing rounder and rounder as time progresses, especially after the birth of her son, and I also wrote how charmed Charles was by her increasingly curvaceous figure. In the 1670s, plump women were prized and admired, and gentlemen sighed as they watched a lady work through a hearty meal with gusto. Imagine if there were novels in which precisely such size-positive, pro-indulgence, curve-adoring attitudes were expressed. Such texts would go a long way towards reintroducing to today's readers the very concept of plus-size beauty, which is an unthinkable idea to much of the general public, brainwashed as it is by present-day anti-feminine, anti-plus aesthetic values. In fact it’s really only been since the flappers of the 1920s that a boyish figure has been considered fashionable, and that the full cheeks that Regency ladies “improved” with cork were replaced by the hollowed high cheekbones of Vogue models. While there are a few notable exceptions, many historical romance heroines follow twentieth century tastes rather than those of her own time...I didn't imagine any of my romance heroines resembling Rubens' Graces; unconscious self-editing, I suppose, or simply following the writing crowd. Imagine that -- an open admission: "We're distorting the past." Would that Hollywood could be this honest about its agenda. Now, the reasons why both traditional aesthetic and traditional moral-philosophical values are suppressed and modern values put in their place in period pieces, both in literature and film, is similar: the authors' wish to suppress those timeless principles and all that they represent. The simple fact is that historical values are dangerous to the worshippers of the religion of modernity. They know that should the public be exposed to all of the beauty that past ages held as ideal, they would reject present-day thinking and desire to recover the nobler cultural principles that we have lost. The greatness of the past is a rebuke to the degeneracy of the present. No wonder it is suppressed. Everyone who admires full-figured beauty should do everything in their power to spread an awareness of what the true values of past ages were. Such knowledge made even the author of the linked blog post question her own tampering with history. The more people realize that the androgynous standard is an aberration, a mere anomaly in time, an unnatural deviation from true, timeless principles of beauty, the weaker the hegemony of the emaciated ideal will be, and the more comfortable the public will become in rediscovering and embracing traditional ideals of full-figured femininity. 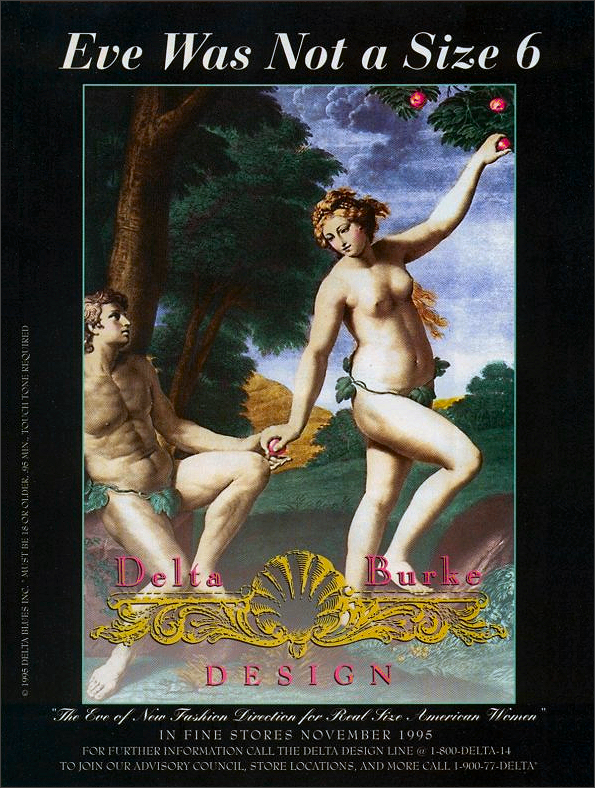 Further to this topic, viewers might be interested in a remarkable advertisement from 1995 promoting Delta Burke's new line of clothing. Of course, everyone here will be familiar with actress Delta Burke, who blossomed into a full-figured goddess during the run of the show Designing Women and became one of the most gorgeous women ever to appear on prime-time television. A fine account of her story and how she transitioned into a clothing designer appears here. This advertisement, featuring a Baroque painting of the Adam and Eve motif, is one of the earliest examples we have yet come across depicting the timeless ideal of full-figured feminine beauty as a preferable aesthetic to the modern media's starvation standard, particularly as applied to a fashion context.